Hey coffeeholics! Yes, I'm finally holding my very first giveaway! I've always enjoyed joining giveaways. Even before I got into blogging for fashion. I used to join giveaways and also gave away virtual stuff in the forums where I once used to be active in. But this is like ten times so much cooler coz its real life and to actually bless someone with something like this tickles me to my toes! What's so amazing is just before I started this giveaway, I finally was able to win 2 giveaways. YAY!!! (much thanks to Kat and Diane!) I will definitely be blogging about that soon. AND now its MY turn on the other side of this giveaway! Most of the stuff that I bought here for the giveaway is all because of blogging. Some of the other stuff are personal gifts given to me. And the rest were personally bought for me. None of these items were given to me to advertise their products. Its just these little things which I personally like which I want to share to others. If you haven't noticed it by now, then you should know that I'm very much into accessories! 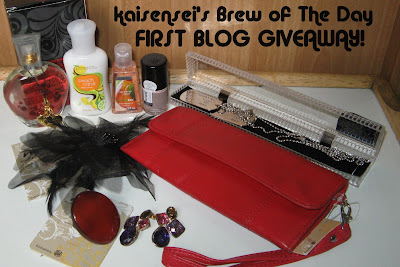 And the items I chose here are things which I personally would use if I won this giveaway. Yes, black and red seems like the theme that I'm getting into. For some reason, I'm slowly falling in love with red! And of course, black is always my first love.. I also included a touch of purple in this giveaway. This wouldn't be "me" if it had not a single purple thing there! Here are the items I'm giving out. Hope y'all like em! SM ACCESSORIES items are soooo cool! Love it! 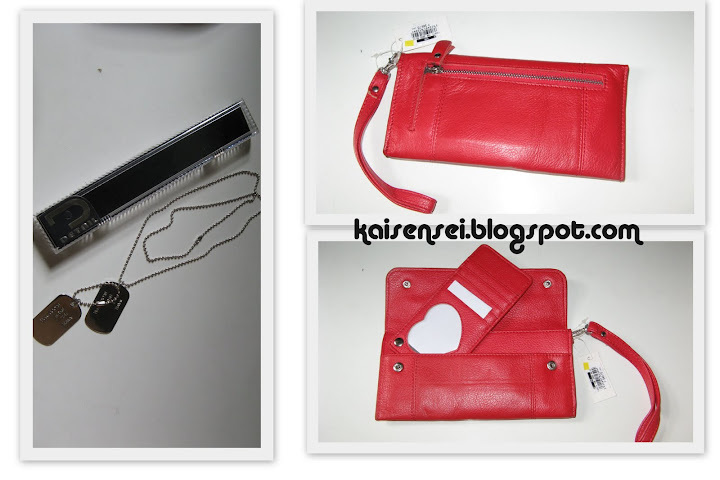 Red wallet is my favorite!!! PURPLE EARRINGS I bought from Earth during BU event! 1. Dogtag Necklace by DETAILS - SM Accessories. 2. Red Wallet - M.I.C. - SM Accessories. I got this during the Launching of the Tomato Fragance Line Event. I haven't used it yet because I had really planned on using this for a giveaway! Why Bath and Body Works? They have been my favorite lotion brand ever since I can remember. I love their products and have plenty enough to share it with you all! Tony Moly Nail polish on photo is a sample only. I will buy a new one and probably not same color. 10. Mystery item. Not included in the pic. TBA! Sorry. This giveaway is limited to Philippine residents only. 2. Like Kaisensei's Brew of The Day Fanpage on Facebook. "Join @kai_sensei's Brew of The Day 1st Blog Giveaway at http://kaisensei.blogspot.com/2011/08/kaisenseis-brew-of-day-first-blog.html"
3. Blog about this giveaway. A sidebar post will do. +1 entry. You may use this pic! 6. Show my blog sisters some love! These two ladies are my fashion fashion BFFs since childhood. Follow the blogs of JEN and RACHE! +2 entries. For the entry to count, you have to follow them both. Click their names to visit their blog! Now all you have to do is accomplish the form below! Don't forget, Giveaway ends on AUGUST 15. EDIT: I will be moving the date to August 20 and it ends at exactly 11:59 PM. I will be announcing the winner at August 21! I will choose winner by either doing it the old fashioned way (paper and pencil, drawing of paper slips!) or use random organizer if there are a lot of entries! Thank you and spread the word dears! Mwah!